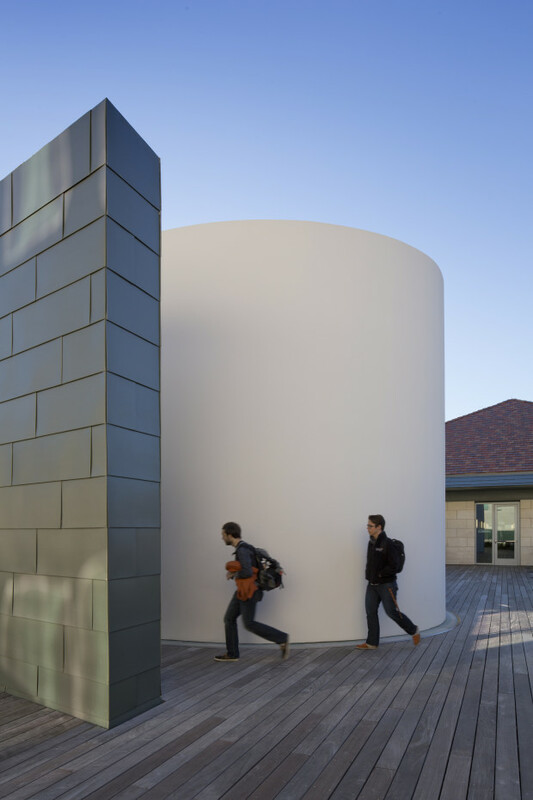 Located on the rooftop of the Student Activity Center at The University of Texas at Austin, "The Color Inside" is James Turrell's eighty-fourth Skyspace, an elliptical structure of white plaster with an oculus in the ceiling that allows light to penetrate the space. A black basalt bench surrounds the interior, providing a reclined seat from which to contemplate the sky. Custom LED lights illuminate the interior and exterior of the Skyspace. Daily, at dawn and dusk, the lights are programmed to change in intensity and color, simultaneously altering the appearance of the sky through the oculus. Before the new Student Activity Center was designed for The University of Texas at Austin, the student body was surveyed as to its preferences for the Center. 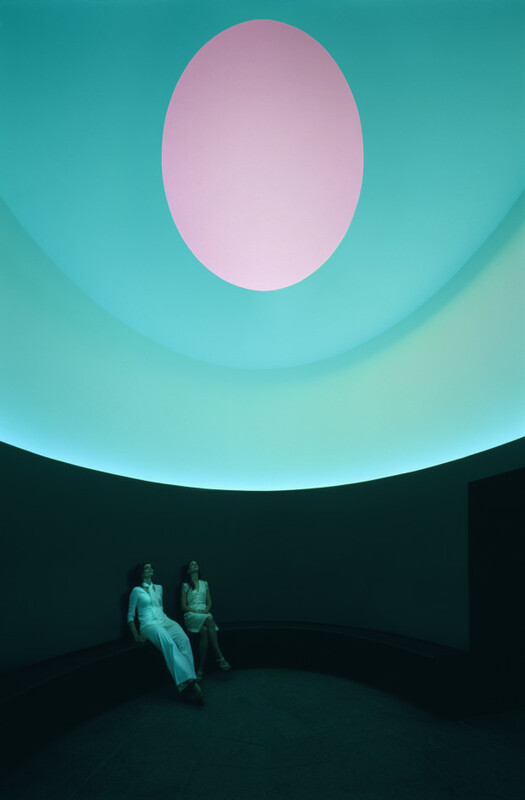 A place for quiet reflection was on that wish list, and James Turrell’s "The Color Inside" is just such a place. During the day, the Skyspace provides a meditative and contemplative rooftop destination for the benefit of those students who frequent the building. At sunset, guests visit "The Color Inside" to experience the light sequence when LED lights transform the space, complementing and contrasting the changing color of the sky viewed through the oculus. 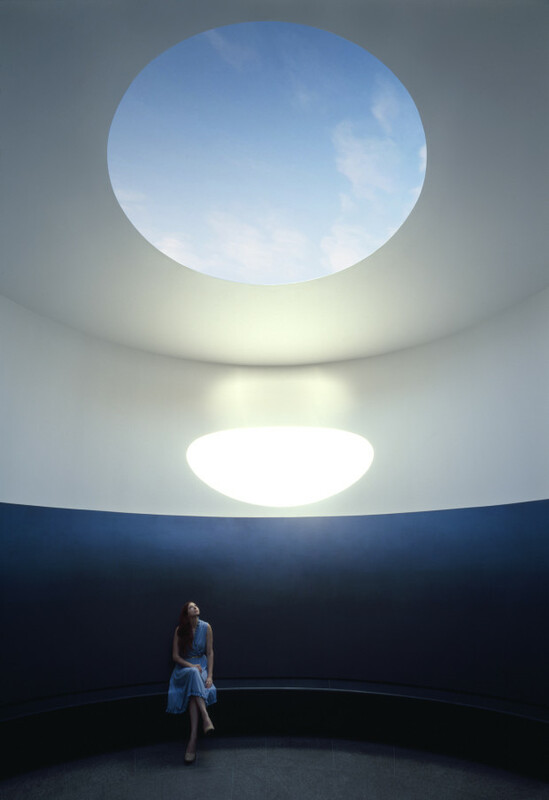 Light is Turrell’s principal medium. His history as a Quaker, experience as a pilot and education in perceptual psychology, mathematics and astronomy all contribute to his exploration of light. 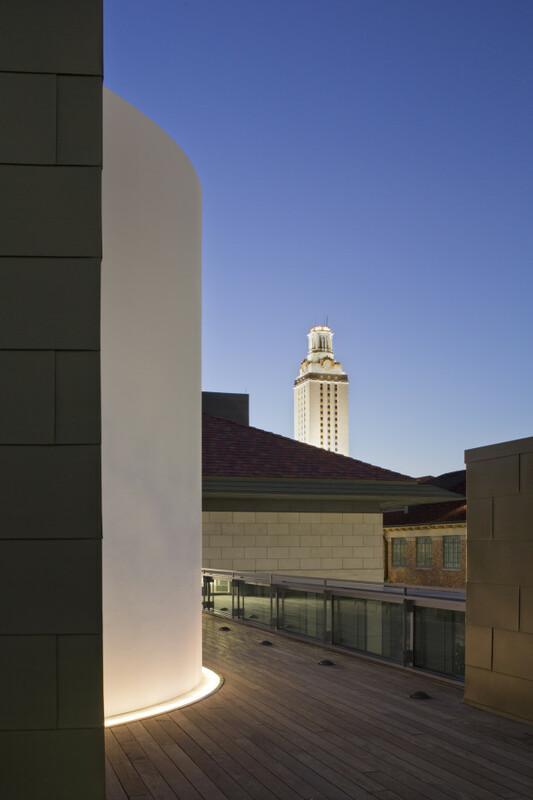 By including Turrell’s work in the university’s public art collection, Landmarks presents the university community with art that can be experienced as a meditative and spiritual journey. The siting, design and construction of "The Color Inside" required the collaboration of several organizations and individuals. Unlike many examples of public sculpture, the process of designing and constructing the Skyspace was much like creating a building, fulfilling the artist’s vision and specifications through the services of architects, engineers and contractors coordinated by Landmarks and UT System’s Office of Facilities Planning and Construction. The Student Activity Center was designed by Overland Partners architects who also served as lead architects for the Skyspace, and the contractor was SpawGlass. Years of coordination between all parties resulted in a happy balance between the artist’s stringent requirements for materials and construction techniques with the very practical needs of a public space on a university campus. As a result, the pristine beauty of the Skyspace meets safety code requirements and can withstand the wear and tear from thousands of visitors a year. Because of the collaboration between the building’s architects and the artist, the designers were also able to provide radiant heat to the Skyspace's black basalt seating through the building’s HVAC system. 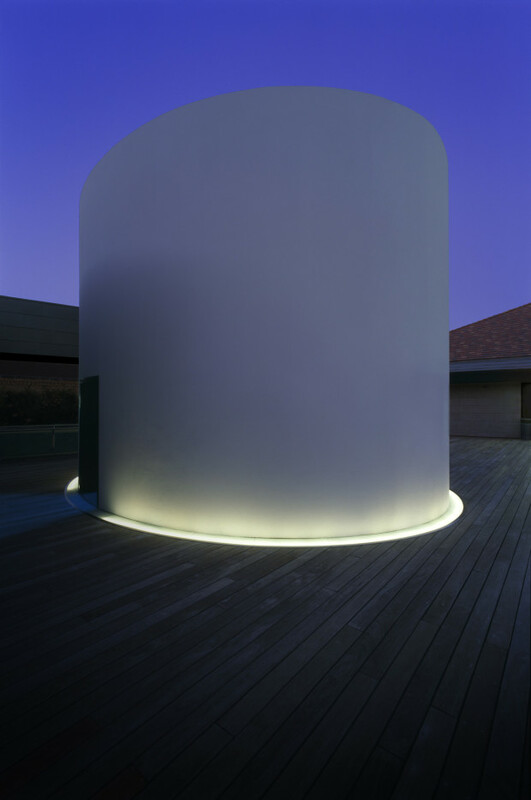 James Turrell sited the work on the rooftop just within the campus height restrictions so that nothing would obstruct its view. As such, it is somewhat hidden from visitors who enter the Center from the street; thus, one must make a pilgrimage of sorts in order to find it. 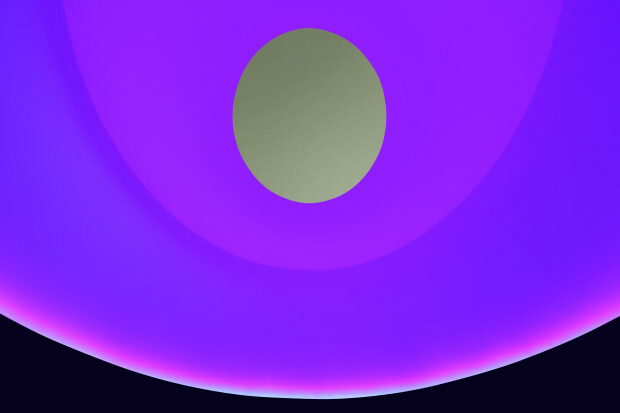 It is a strategy Turrell has engaged many times before: by making his works difficult to find, anticipation is heightened, enhancing the overall experience of the work upon its discovery.